marriage license | Scuffalong: Genealogy. 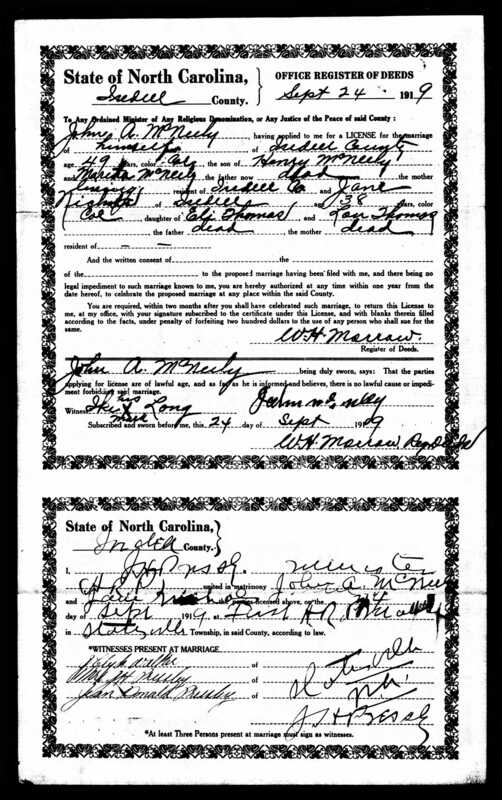 marriage license – Scuffalong: Genealogy. As mentioned, Nancy Henderson Smith was my great-great-great-grandfather Lewis Henderson‘s half-sister, but she was closer in age to his children. She and her sisters Mollie Henderson Hall Holt and Louella Henderson King Wilson Best Laws were particularly close to Lewis’ daughter Sarah Henderson Jacobs Silver, who reared my grandmother (her sister Loudie‘s grandchild) after she was effectively orphaned. In 1881, Nancy married Isham Smith. They settled in the Harrell Town section of Goldsboro, where Isham worked as a wagon driver, occasional blacksmith, and then an undertaker. Their children were: Annie Smith Guess (1883-1953), Oscar Smith (1884), Furney Smith (1886), Ernest Smith (1888-1918), Elouise Marie Smith (1890), Johnnie Smith (1891), Mary E. Smith Southerland (1894), James Smith (1896), Willie Smith (1899-1912), Effie May Smith Stanfield (1904), and possibly Bessie Lee Smith (1911). (Was Bessie really a daughter? Nancy was born about 1864! A granddaughter maybe?) 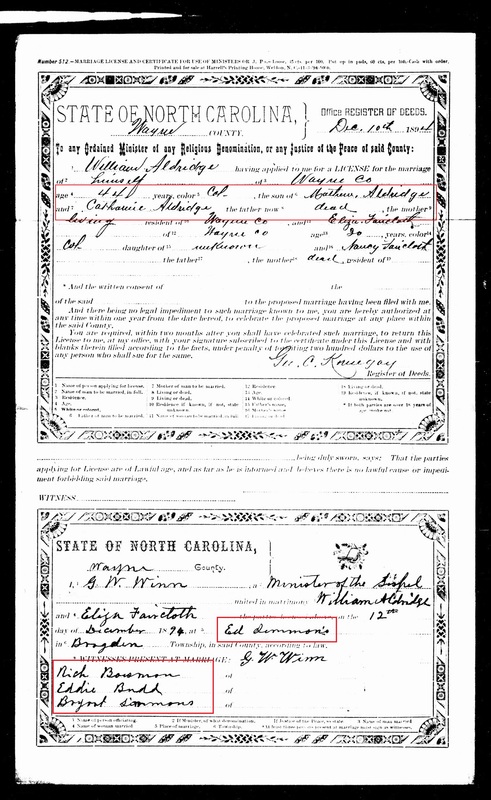 Isham died in 1914, and Nancy married Patrick Diggs four years later. After Patrick’s death, Nancy restored her first husband’s surname. She died in Goldsboro in 1944. Another example of official laziness — though both Annie’s parents were living, only one is named. What Methodist church in Goldsboro? A Google doesn’t turn up much, but revealed that a Rev. J.J. McIntire was an African Methodist Episcopal minister in the South Wilmington (North Carolina) circuit in 1916. James Guess was a multi-faceted businessman, to say the least, with interests in barber shops, pool halls, real estate and a flourishing undertaking operation. He died in 1957 at a hospital in Chapel Hill, North Carolina. Annie Smith Guess died of heart disease 8 August 1953 at her home in Goldsboro. This was a short-lived marriage. 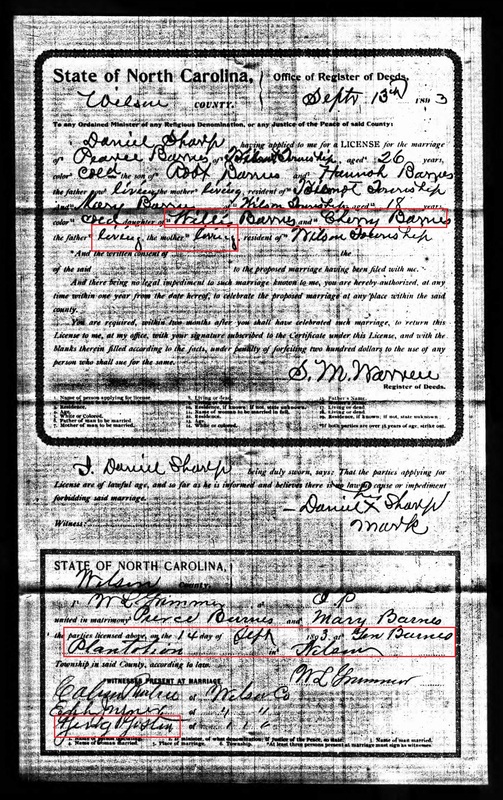 In 1910, the census of Goldsboro showed Carrie Smith living at home with her parents, Furney and Clara Wooten, her siblings, and her not quite two-year-old daughter Pauline Smith. 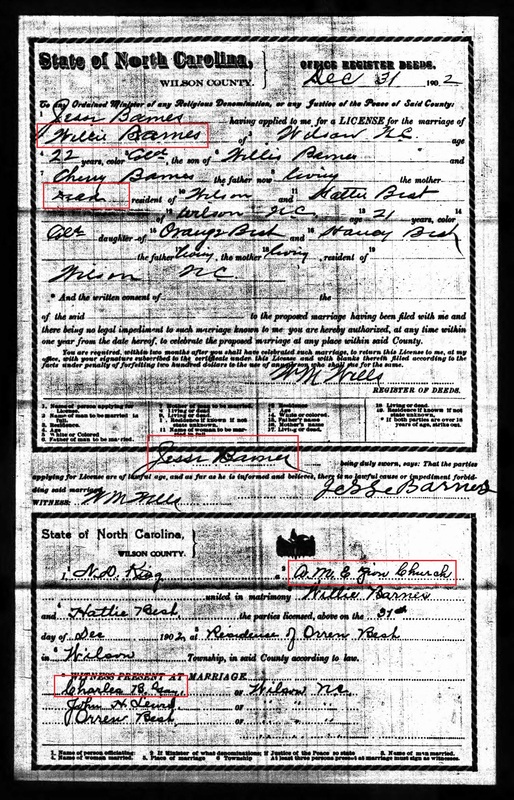 In the 1920 census, Carrie Smith is described as a widow, and she and Pauline remain in Clara Wooten’s home. And again, Isham is named, Nancy is not, though both were living. This time, the Methodist Episcopal church. A search for John H. Isham doesn’t yield anything. 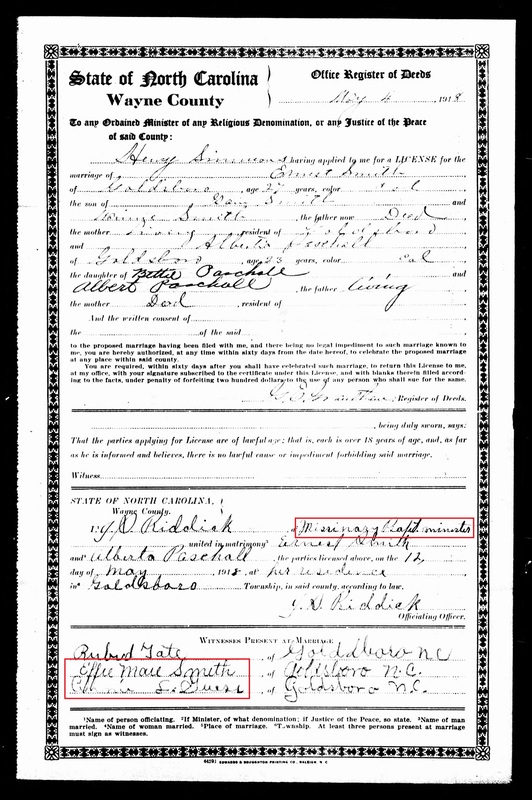 Alberta Paschall was soon to be the wife of Johnnie’s brother Ernest Smith, see below. 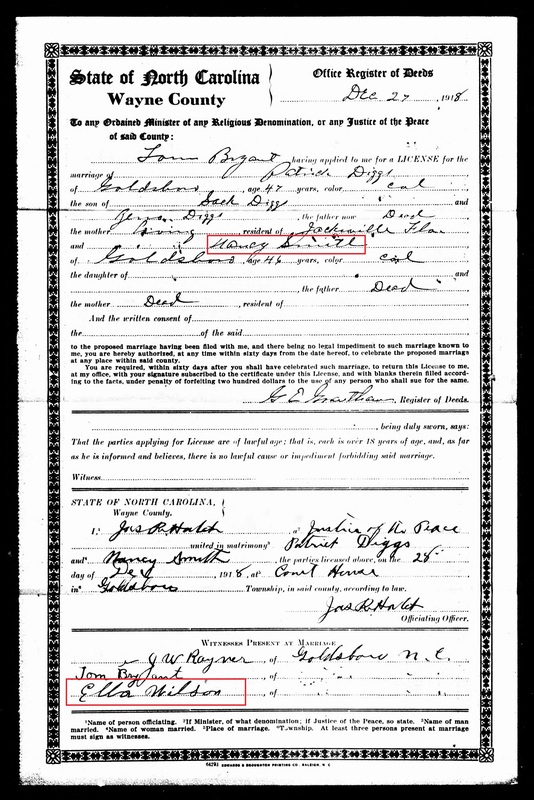 Five months after he married, Johnnie registered for the World War I draft. 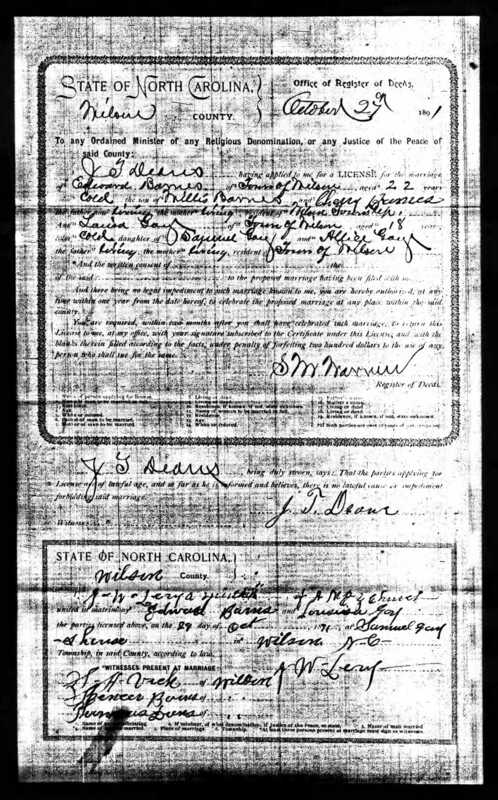 His draft card stated that he resided at 100 Smith Street in Goldsboro (his parents’ house); was 22 years old; worked as a laborer for Isaac Cohnes of Goldsboro; was married; and was of short height and medium build with brown eyes and black hair. Sylvia Kornegay Smith gave birth to a stillborn son in 1920, then to a son Herbert in September 1922 who died at age six moths. Son Russell Smith was born in 1925 and appears to have been Johnnie’s only living child. 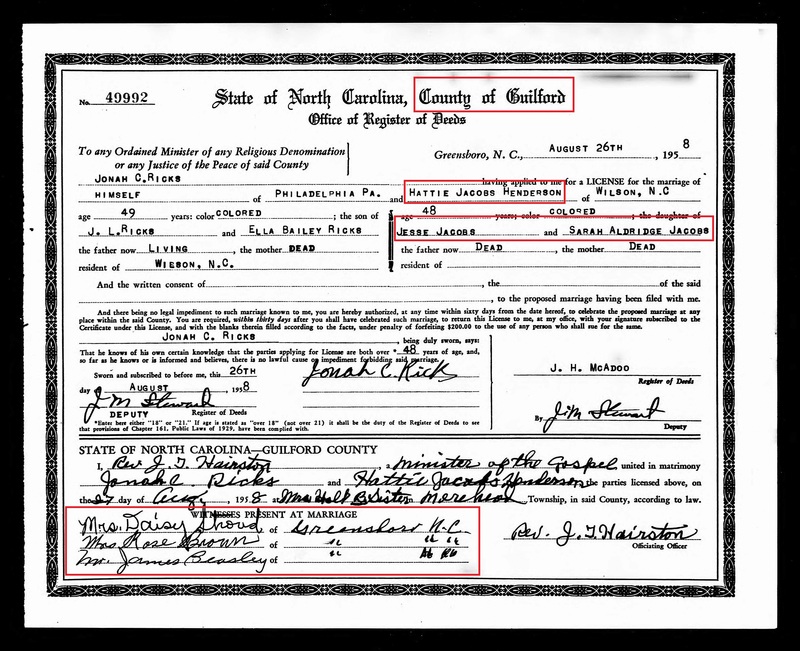 The family appears together in the 1930 census of Goldsboro, at which time Johnnie worked as a carpenter and Sylvia as a laundress. 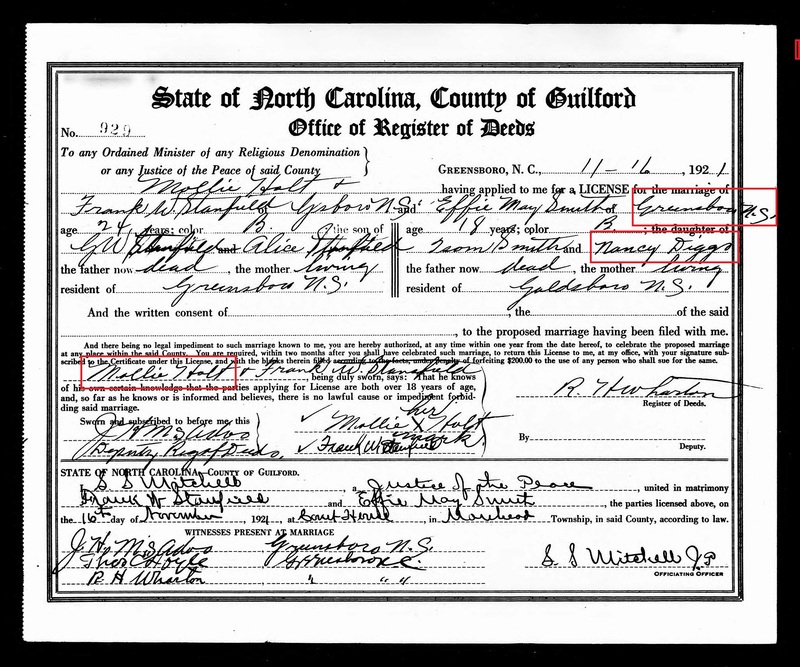 They split before long, however, as the 1940 census of Goldsboro showed Johnnie and his siblings Bessie and Jimmy living with their mother Nancy Smith. I have not found Johnnie’s death certificate. As late as 1959, Johnny Smith is listed in the Goldsboro city directory living at the Smith “home house,” 309 Smith Street. However, I have not found his death certificate. A Missionary Baptist minister performed this ceremony. Alberta’s church, perhaps? Ernest’s sisters Effie Mae and Annie were witnesses. 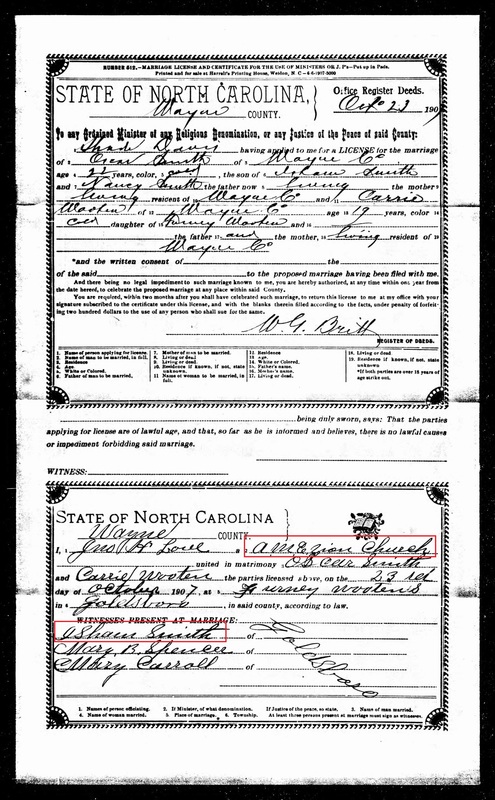 Ernest and Alberta had had a child together, a stillborn girl, born 1914 in Goldsboro, Wayne County. They had no others. 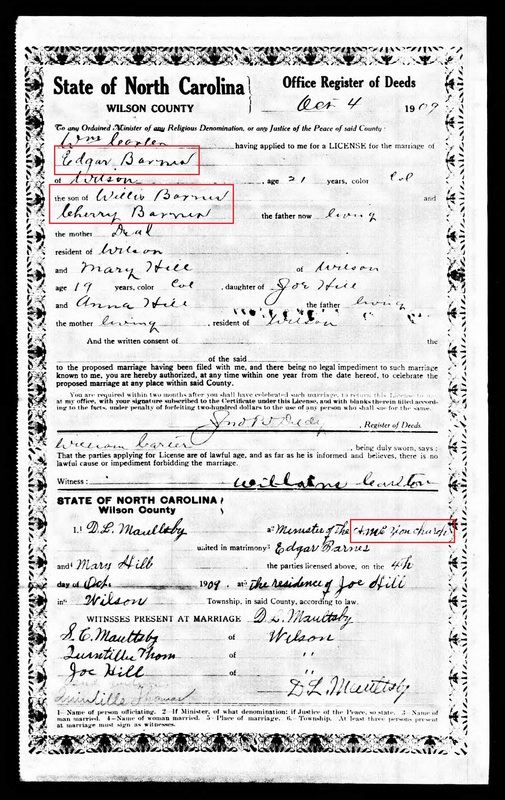 Ernest, a barber, died 5 October 1918 of lobar pneumonia in Goldsboro — five months after he married. 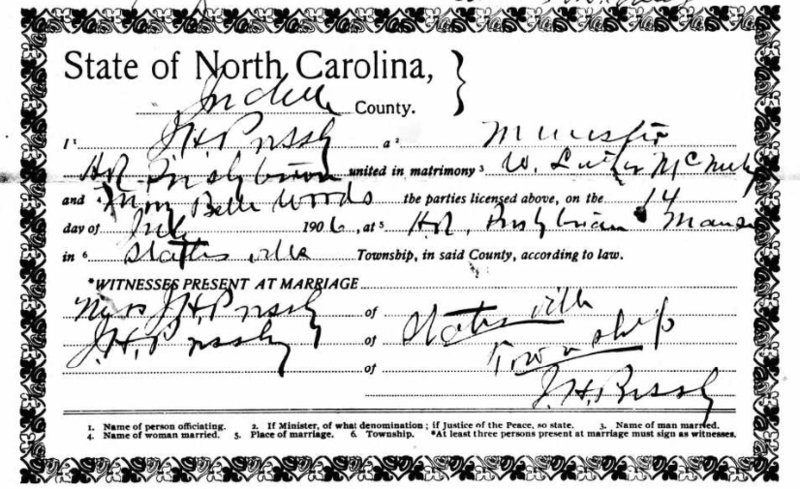 Nancy’s second marriage, which ended with Patrick Diggs’s death before 1930. The family appears in the 1920 census, Goldsboro, Wayne County: on Smith Street, Patrick Diggs, tinned at W.A. Works; wife Nancy; stepdaughter Bessie Lee Smith; and widowed “stepdaughter-in-law” Alberta Smith, a cook. Surprise, surprise. 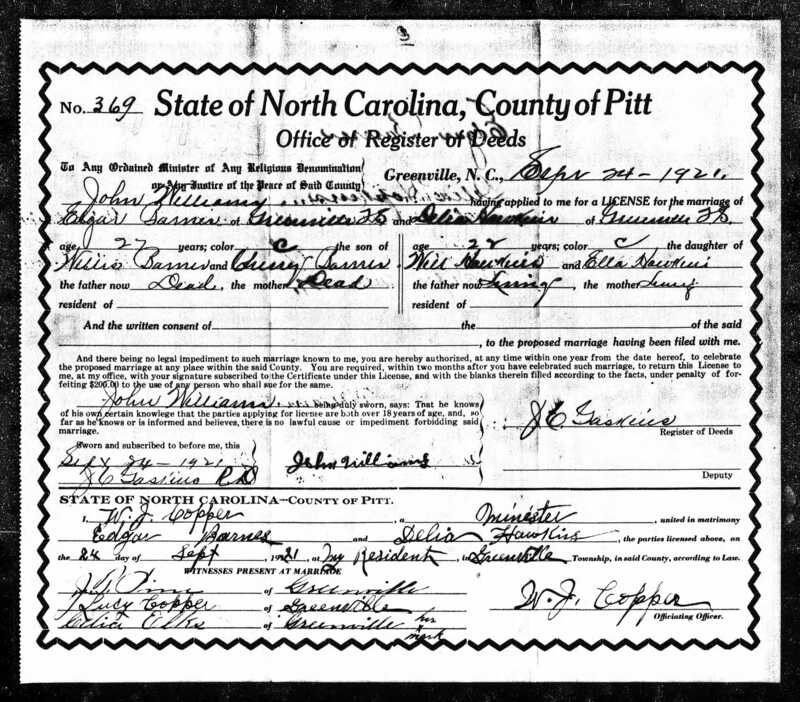 My great-aunt Mamie was not the only relative to follow Mollie Henderson Holt to Greensboro. Nancy is listed with her second husband’s name. This is my last sighting of Effie Mae. 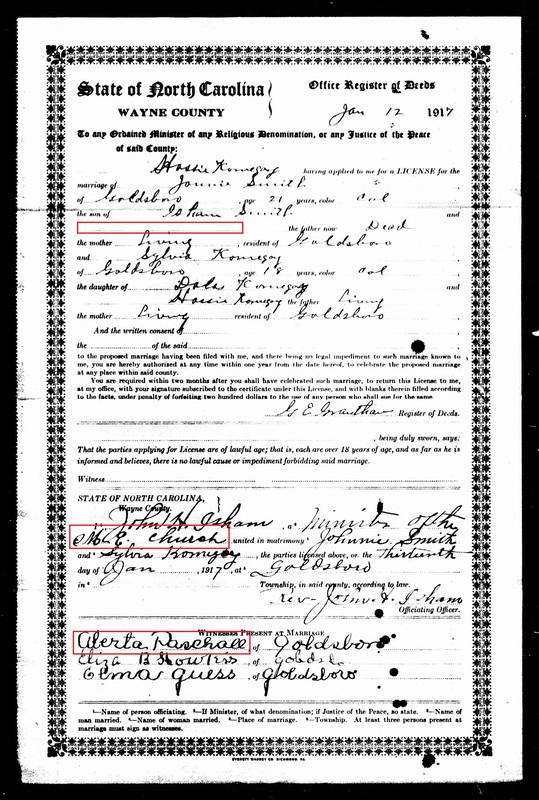 I have not found death certificates for her or her husband, but neither seems to appear in subsequent census records. And in the 1930 census, their seven-year-old daughter Vivian Stanfield was living with her grandmother “Nannie” in Goldsboro. And what of Nancy’s remaining children? 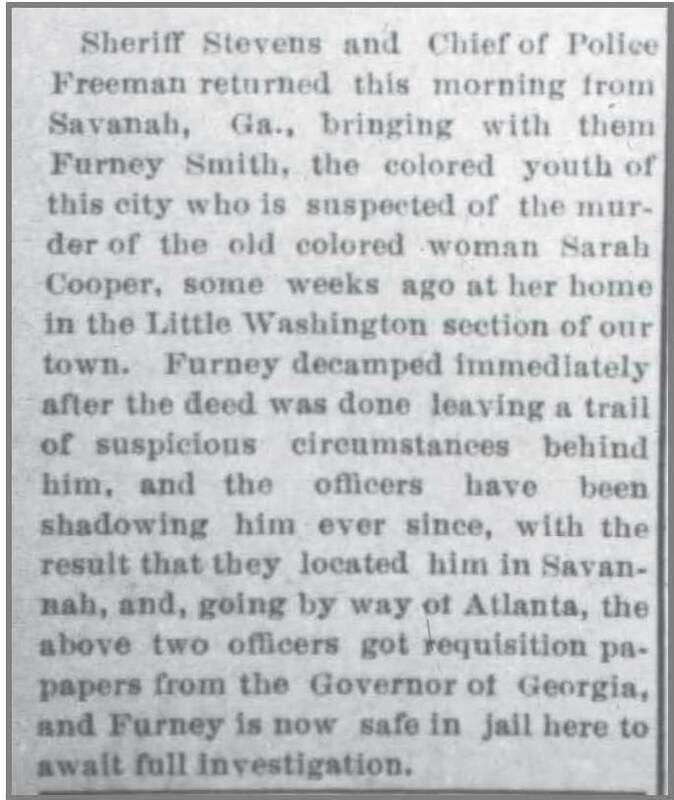 Goldsboro News Argus, 27 January 1906. Goldsboro News Argus, 23 February 1907. 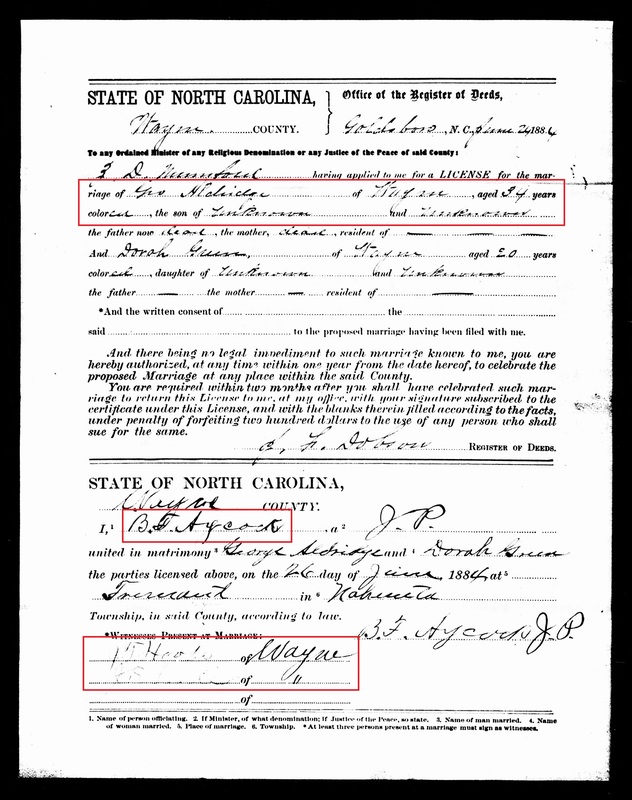 Mary E. Smith Southerland is listed as an informant on the delayed birth certificate of her sister Effie Mae Smith. I have not found a record of her marriage to a Southerland. James “Jimmy” Smith was born 18 April 1896. 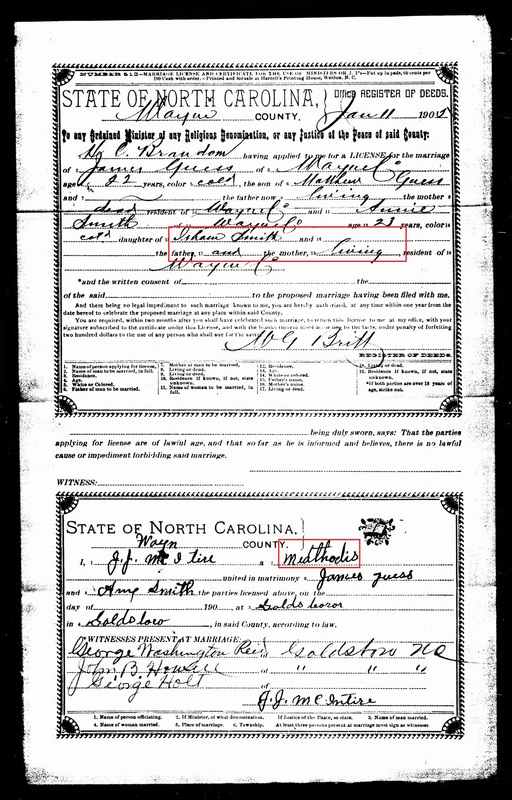 When he registered for the World War I draft in 1917, he reported that he resided at 100 Smith Street in Goldsboro NC; that he was born in Goldsboro; that he worked as a bottler as a bottling company; that was single; that he was of medium height and weight; and that he had black eyes and hair. 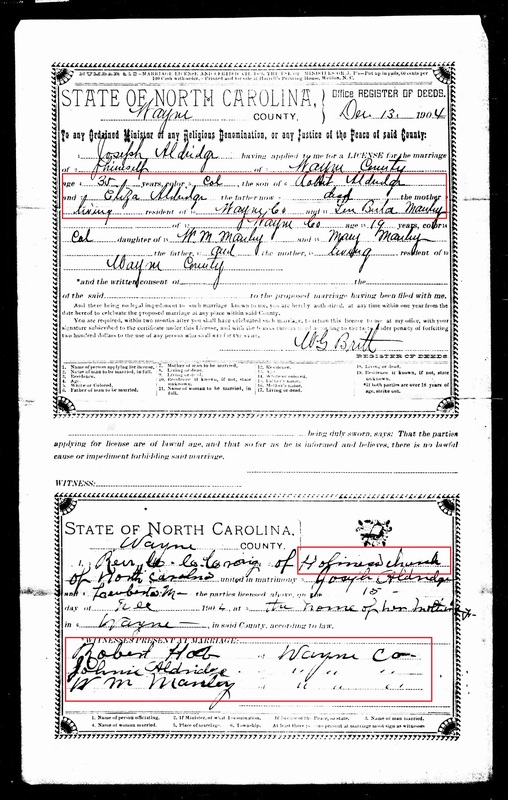 He likely was not the James Smith that married Lou Pearl Moses on 15 November 1916 in Goldsboro. He is last seen in his mother’s household in the 1940 census of Goldsboro. Twelve year-old Willie Smith died of kidney disease (“nephritis”) on 29 June 1912. Bessie Lee was born about 1911. If Nancy were her mother, she’d have been in her late 40s when Bessie was born. Not impossible, but perhaps unlikely. Still, she is consistently referred to as daughter, rather than granddaughter, so I’ll leave it there for now. I have no record of any marriage for her, and she and two brothers appear in their mother’s household in the 1940 census. Reka Aldridge‘s father George W. Aldridge was the brother of my great-great-great-grandfather John W. Aldridge. Wayne County clerks sometimes listed mothers by maiden name, but more often didn’t. Dora was a Greene. Witness Eva Aldridge was the bride’s sister. 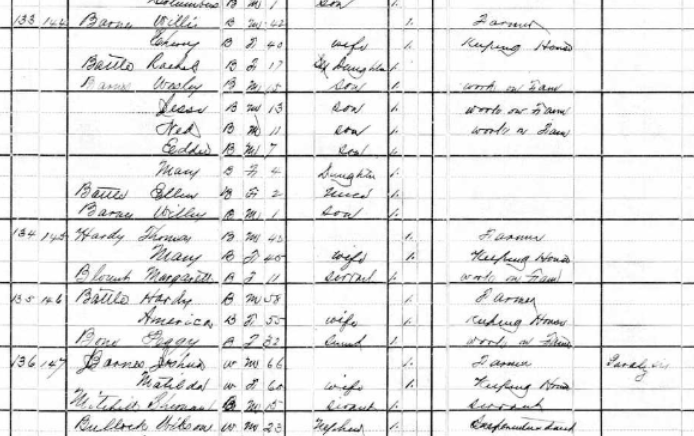 William J. Boswell appears in the 1910 census of Nahunta township, Wayne County, as a married, 30 year-old house carpenter. Ezekiel B. Bailey, 23, white, appeared in his mother’s household in the same township. Robert and Mary Eliza Balkcum Aldridge‘s youngest sons, Robert Jr. and Joseph, married relatively late. Joseph Aldridge was 16 years older than his first wife, Lou Berta Manley. Witness Johnnie Aldridge was Joseph’s nephew, son of John W. and Louvicey Artis Aldridge. W.M. Manley was Lou Berta’s father. 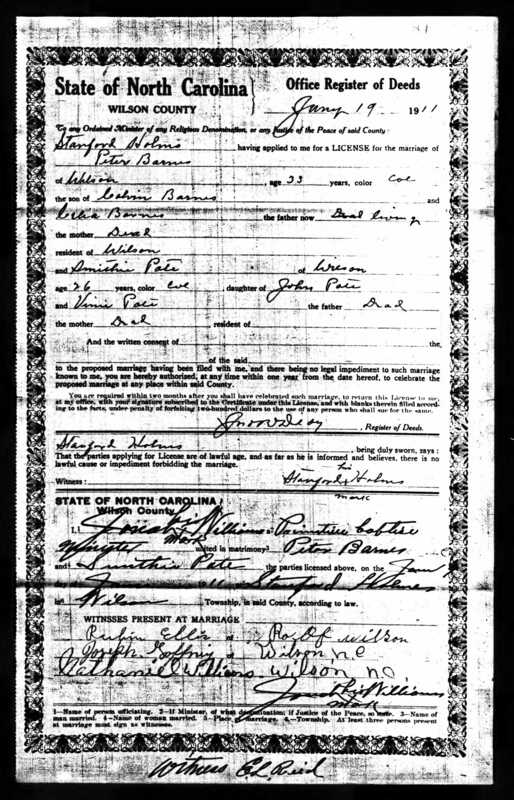 “Robert Hob” was possibly Robert Hobbs, who appears in the 1910 census of Grantham township, Wayne County, as a 24 year-old farmer. 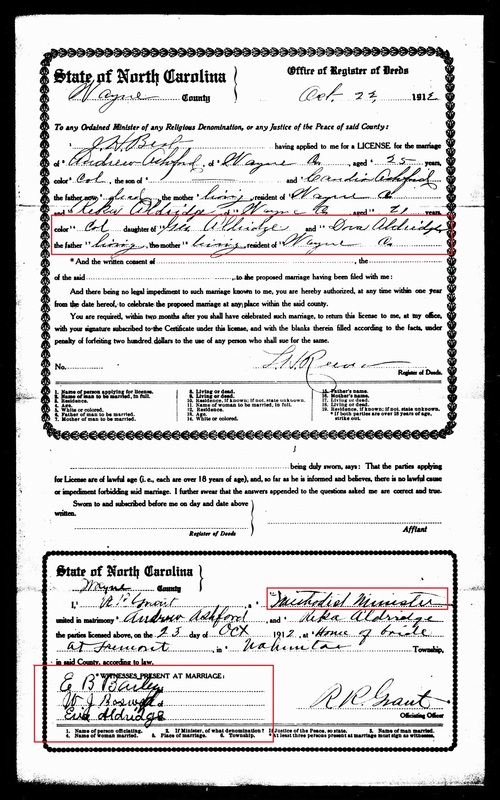 William Aldridge was the son of J. Matthew and Catherine Boseman (or Simmons?) Aldridge. His father died in 1868. The ceremony took place at Edward Simmons, whose identity is not clear to me. Richard Boseman was the son of James and Tempsey Locus Boseman. James Boseman appeared in the household of J. Matthew and Catherine Aldridge in the 1860 census of Buck Swamp, Wayne County. (James may have been Catherine’s brother.) 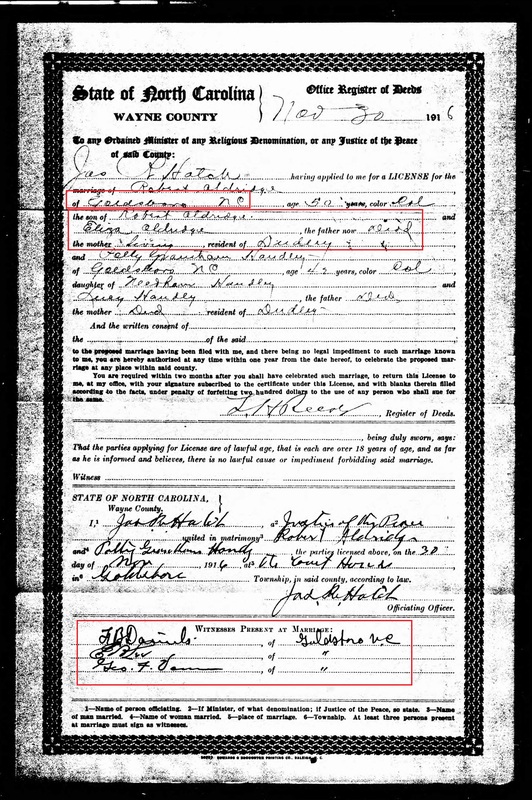 Richard married Lillie Mae Aldridge, Matthew and Catherine’s daughter. Eddie Budd was the son of Haywood and Phereby Simmons Budd. There were several Bryant Simmonses, but this was likely the son (1831-1890) of James and Winnie Medlin Simmons. Of course, George Aldridge knew full well who his mother and father were, and both were living when he married Dora Greene in 1884. I see this omission a lot. Laziness or “who cares?” by the Register of Deeds? Benjamin F. Aycock was later elected as Republican state senator. It’s difficult to read the names of the witnesses, but neither appears to be a known relative of George. This is Robert Aldridge Jr.‘s second marriage. His first, to Ransy Pearsall, was in 1903. Frank “F.B.” Daniels appears in the 1910 census of Goldsboro, Wayne County, as a 20 year-old white lawyer. George F. Vann appears in the 1910 census of Stony Creek township, Wayne County, as a white, 20 year-old farmer. *Actually, this languished in the Draft queue for a few weeks, so it’s not first anymore. My grandmother’s birthday was Saturday, June 6. It would have been her 105th. 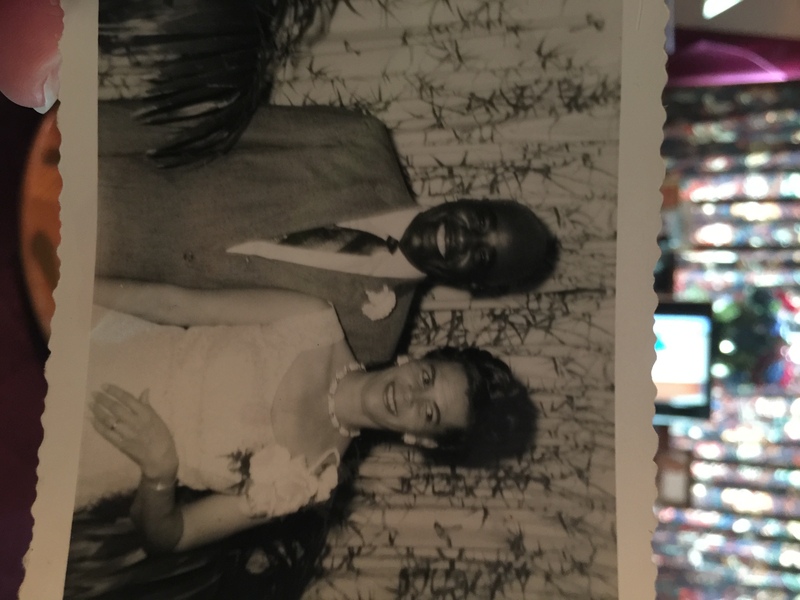 My cousin D.D., her sister’s great-granddaughter, sent me a photo of a photo via text message — Mother Dear and her husband, Jonah Ricks, my step-grandfather. I’d never seen this particular image, but I recognized it as having been taken in Greensboro, North Carolina, at her niece L.’s wedding in 1963. I found their marriage license today. So, first, I had to pick my jaw up. I knew they’d wed in August 1958, but had never been able to find a record in Wilson. 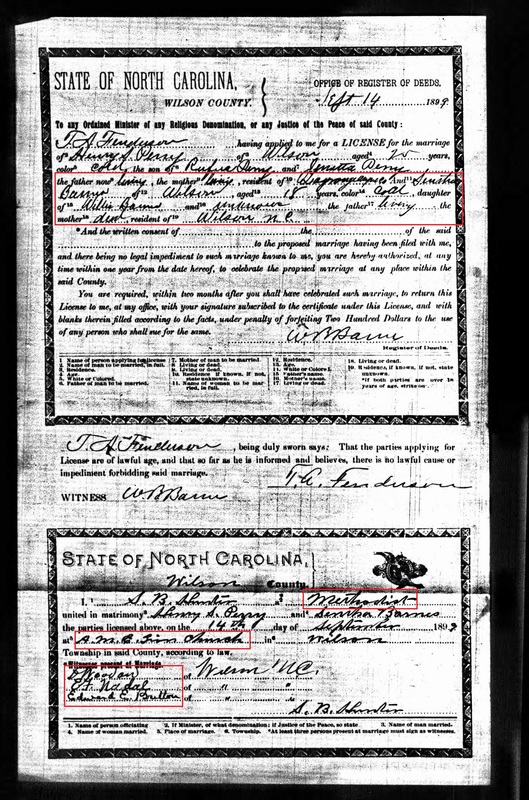 Because they married in Guilford County. In Greensboro. I immediately thought about this little snapshot. This wasn’t taken in 1963! Mother Dear and Granddaddy Ricks had traveled to her sister’s for the ceremony, and this photo was taken on their wedding day. Why hadn’t I registered the boutonniere, the corsage, the beringed left hand held high? Then I got around to looking at the rest of the license. First, there’s the matter of my grandmother’s name. In that era, legal names were somewhat fluid, and changing them did not necessarily involve legal drama. 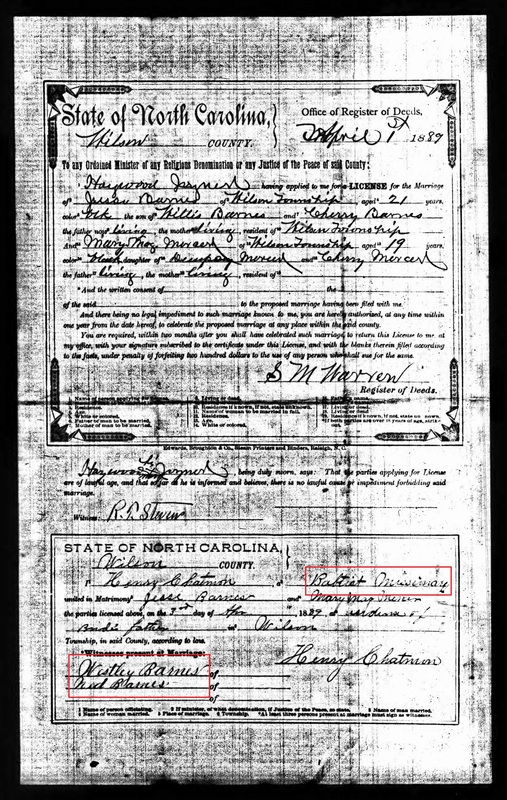 Bessie Henderson bore my grandmother before North Carolina required birth certificates. Bessie named the baby Hattie Mae and gave her her last name. Bessie died less than a year later, and little Hattie went to live with her great-aunt and Uncle, Sarah and Jesse Jacobs. She called them Mama and Papa and became known as Hattie Jacobs. Only after Sarah’s death in 1938 did my grandmother learn that she had never been formally adopted. (And as a consequence, she was forced out of the house on Elba Street by Jesse Jacobs’ children.) She immediately changed her name to Hattie Mae Henderson. I was surprised then to see her name listed as “Hattie Jacobs Henderson” some 20 years after she dropped the appellation. Mother Dear also listed Jesse and Sarah Jacobs as her parents on the license. Here is an example of the way documents may reflect social and familial realities, rather than legal or genetic ones. Curiously, though, there is a hint to Mother Dear’s paternity in the license, though inexplicably placed. Mama Sarah was born Sarah Daisy Henderson. Her first husband was Jesse Jacobs and her second Joseph Silver. She was not an Aldridge. But my grandmother’s birth father was. Why did my grandmother report Sarah’s name this way? Maybe Mr. Ricks gave the information and got his facts twisted? Last, the witnesses. I recognize James Beasley — he married my cousin Doris Holt — but who were the others? Friends of my great-aunt Mamie Henderson Holt, perhaps?